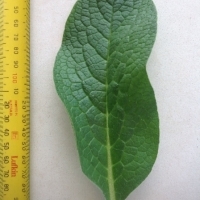 This well-known showy plant is a member of the Borage and Forget-me-not tribe, Boraginaceae. 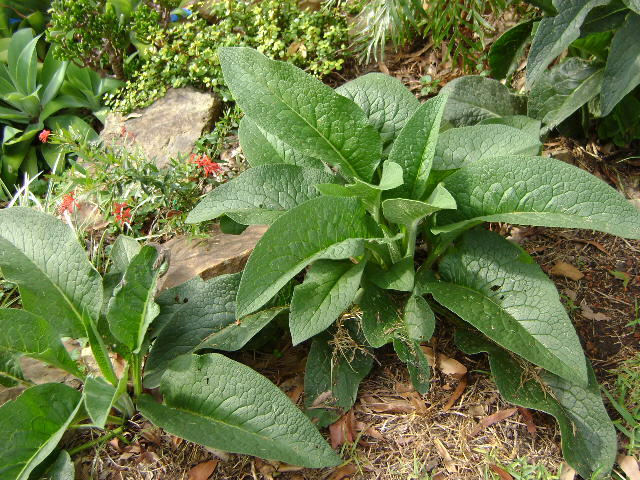 A hardy perennial, its large leaves are rough and hairy all over. 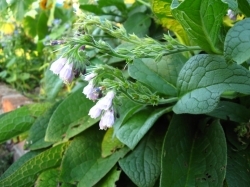 Comfrey thrives in almost any soil or situation, but does best in moist conditions. 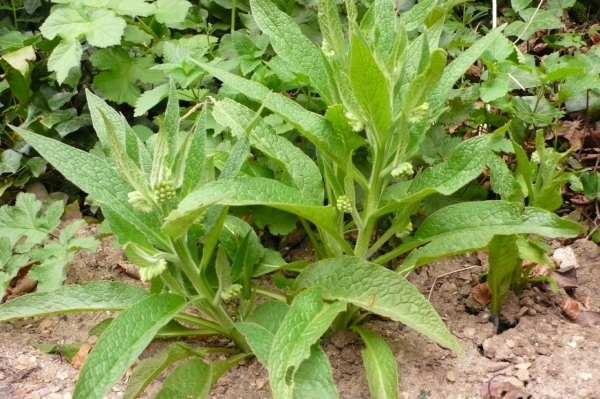 A useful plant it can be used with great success as a liquid manure, activator for compost heaps, a weed barrier or attractive understory plant. Herb without peer. 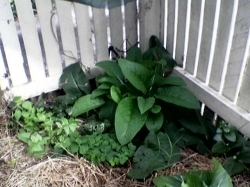 Plant a patch in a damp spot and cut for excellent weed free mulch for the veggie garden all through summer. these have gone so well and have really helped a couple of sick plants that I planted them next to. This year I've divided the roots and now have lots of new plants to be planted out around the rest of the fruit trees. The root cuttings were planted in pots and then transplanted in the ground when the new leaves emerged. 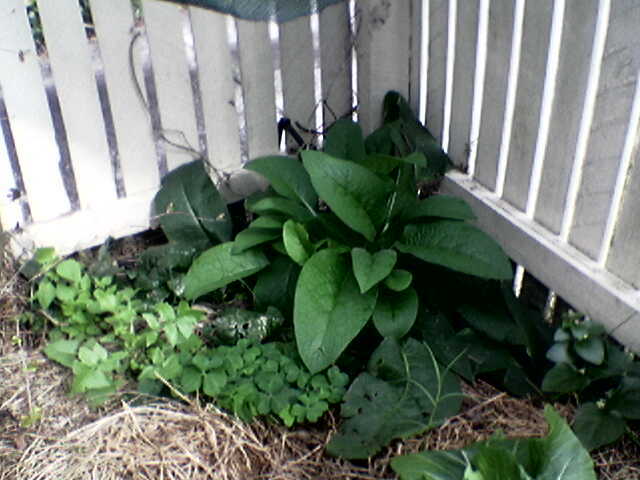 The comfreys are planted on the edge of the fence as a weed barrier. I also plant them near the fruit trees for fresh mulch. 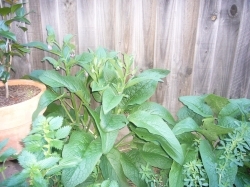 Comfrey (and nettle) leaves make great liquid fertiliser, and is also a great addition to the compost as the help speed up the process. 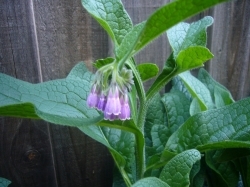 According to some texts, the usefulness of comfrey go beyond as a mulch or liquid fertiliser. It could be said as second to none in the herb kingdom. 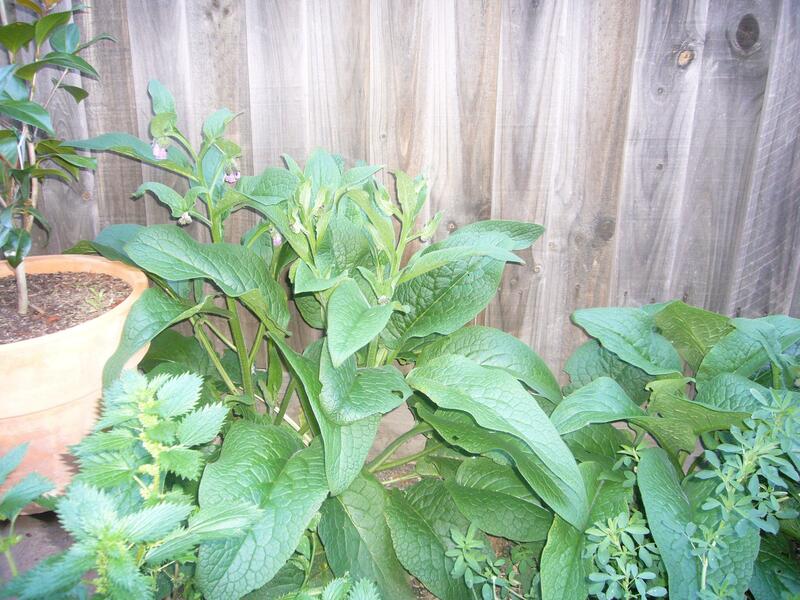 For more information, read 'How to Use Herbs in My Daily Life', by Isabell Shipard. 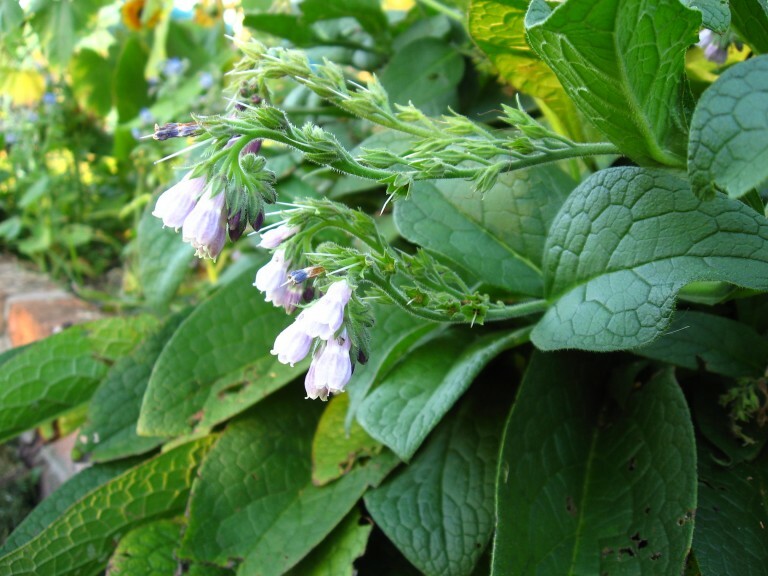 As you can see from the pictures, comfrey can easily make an ornamental plant as well. Planted in the ground in February 2010. I have this plant growing everywhere. 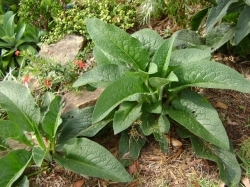 It's great to just cut off all the leaves and throw them over the vege garden and fruit trees as a mulch, and I also use it as a compost tea. Autumn 2012: gift from a friend. I have lots of old fashioned home remedies that use comfrey so I thought I might grow some to give it a go. Again I have been warned to keep this one in a pot to make sure that it doesn't take over the world. Grows well in large pot. Add leaves to worm farm and compost. chooks love it. Multiplies quickly and easily. used to build the soil and as green manure. Also makes a yummy food!